It’s 20 minutes before the first reservation arrives and John the line cook knows that his mise en place is not tight. In a few minutes the chef will be walking the line checking to see that everything is in order. He will taste sauces, review specials and ask a series of questions of each line cook. Sara, who is working grill tonight, is ready. She just exudes confidence, always checking and double-checking everything from portioned steaks and chops to compound butters, fresh herbs, dry rubs, and stocks. Her char-grill is fired up and wire brushed, finishing oven cranked up to 500 degrees, sizzle platters cleaned and counted out, side towels folded, extra tongs in place and a fresh sanitizing bucket in the ready. John, on the other hand is sweating bullets. It started from the moment John walked into work 15 minutes late. The chef has little tolerance for his staff members not arriving at least 15 minutes early. Time is precious and if you start off behind, you stay behind all night. 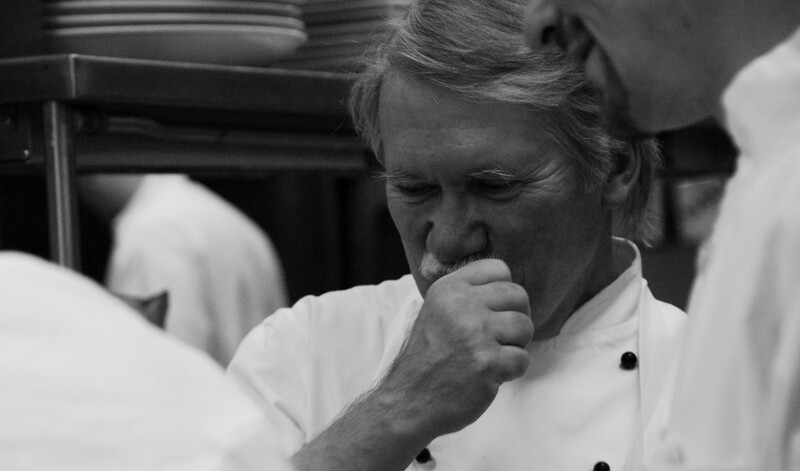 The chef didn’t waste time chewing John out, he simply gave him that look of disappointment. John knew the pressure was on. 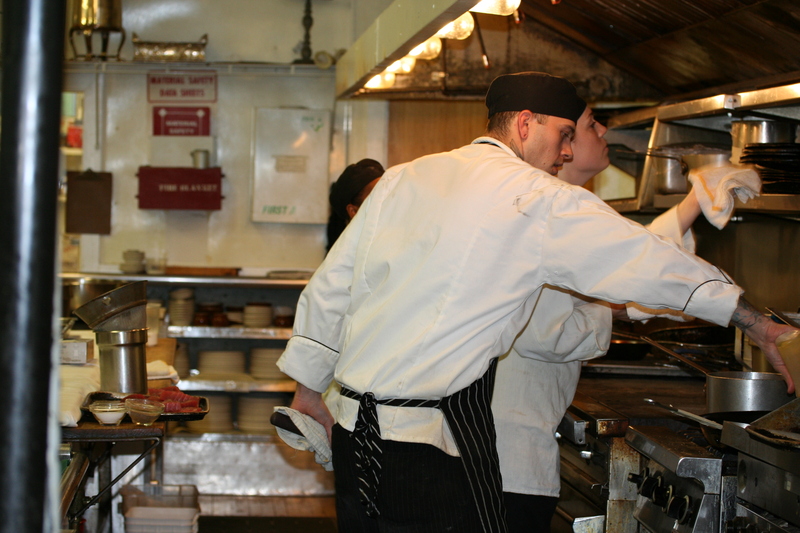 For a line cook, there are few things that feel worse than knowing that you have put yourself in a difficult position and that your lack of organization and punctuality will impact the entire team at some point. No matter how hard you try, from the minute you realize the potential problems, it only gets worse. John was physically shaking and had an uneasy feeling in his stomach as he tried to wash the inevitable from his mind and concentrate on the work ahead. Those who have never worked on the line will have a difficult time understanding what lies ahead for John. The work for today really began at closing last night. Organizing, labeling and dating what could be salvaged from the previous nights closing, making prep lists for the next shift, pulling the occasional item from the freezer and giving notes to the sous chef about what the morning prep crew needs to work on will all set the stage for success or failure the following shift. Fortunately, John had taken care of business at closing, but as he quickly re-assessed his inventory and reviewed reservations for this evening he noticed that he neglected to put two of his sauces on the morning prep list. Now, in addition to his normal work (that he was behind on) he would need to build these sauces that required lots of attention. John set-up his workstation, adjusted his prep sheet, put a quick edge on his knives, pulled supplies from the walk-in and began to tackle what was on the list. He knew that the sauce work must be approached first so after cutting a mirepoix he began to caramelize the ingredients. He deglazed the vegetables with some carry over pinot noir from the bar, added the rich veal stock from the morning prep box, build in a handful of fresh herbs, dropped the flame to a simmer and moved on to other prep. The finished sauce base would be used for two variations of a demi-glace and would still be difficult to finish by 5:30. Now John was faced with his normal prep as he was already running 45 minutes behind. He would need to puree shallots, slice garlic, oven dry plum tomatoes, chopped parsley and fines herbs, clarify 10 pounds of butter, blanch and shock vegetables, turn potatoes, prepare shiitake and porcini mushrooms for sauté, clean scallops, score the skin on snapper for sauté, and the list went on and on. At this point in the late afternoon, every cook was totally focused on his or her individual station. Kitchens during this short, but intense period of time run like out of control machines. People picking up their pace, the music in the background no longer a point of focus, half empty, forgotten coffee cups strewn about the kitchen, every burner cover with a sauce pot or sauté pan, mixtures of aromas from toasting pignoli’s to onions and garlic, and roasting peppers on open flames to parmesan crisp being pulled from an oven permeating the kitchen air. Nerves are on edge because everyone knows that once the doors open, there is no time to continue working on prep. This is the most critical time in a kitchen, what happens during prep will determine how the night goes. John knows that it would not be appropriate to ask others for help at this point. He dug his own hole and he would need to figure out how to climb out. In the back of his mind he thought, he hoped, that Sara (always ready and organized) might be able to help him out at the 11th hour. Of course, when things are this tight, Murphy’s Law kicks in (if something is left to go wrong, it will), and in an instant, John found himself even further behind. He forgot about those pignoli nuts browning (now looking as black as coal), and as he jumped to pull them from the oven, he picked up a wet towel and grabbed the handle of the pan. Steam burns hurt more than any other since they seep below the surface of the skin and draw a cook’s attention for the next few hours to the throbbing impact of a deep skin burn. John dropped the pan; burnt pignoli spread over the floor, and immersed his hand under a stream of cold water. After a few expletives, he returned to his workstation with an ice bucket for occasional hand immersion. The beat goes on. The chef walked by and only shook his head as he moved about his own work. The dishwasher swept up the burnt pignoli nuts and pan as no one else in the kitchen acknowledged John’s dilemma. They stayed focused on their work. Somehow, John managed to get the majority of his mise en place ready. It was now 20 minutes before service and things were coming together except the organization of his station and the finishing of the two sauces. The chef was due to walk through very soon and a look of panic was creeping over John’s face. He looked over at Sara, who was clearly ready to rock on the grill. She looked at him, smiled and simply nodded. Sara took over on the sauces, straining, reducing, adjusting seasoning, and monte au beurre. She managed to wipe down John’s station, fold his side towels, and line up his sauté pans in the oven for pre-heating just as the chef was walking the line. Sara gave John a fist bump as their eyes met. John simply said, “Thanks, I owe you.” The chef smiled as he nodded to Sara. He knew that in the end, teamwork always saves the day. There were still a few minutes before the first ticket arrived in the kitchen. Time for each line cook to force down a five minute attempt at staff meal, kick back an espresso, fill water jugs and listen to the chef give a brief pep talk. This would be a busy night. Somehow, John managed to make it and once again learn how important it is to be prepared, be on time, and work with his exceptional team of warriors. If you are a line cook, or have been one in the past, this brief story is one that you have lived many times- another day in the life.